I don't want to do a huge approach Phil," I said to him when he mentions that he doesn't want to ski anything hard. 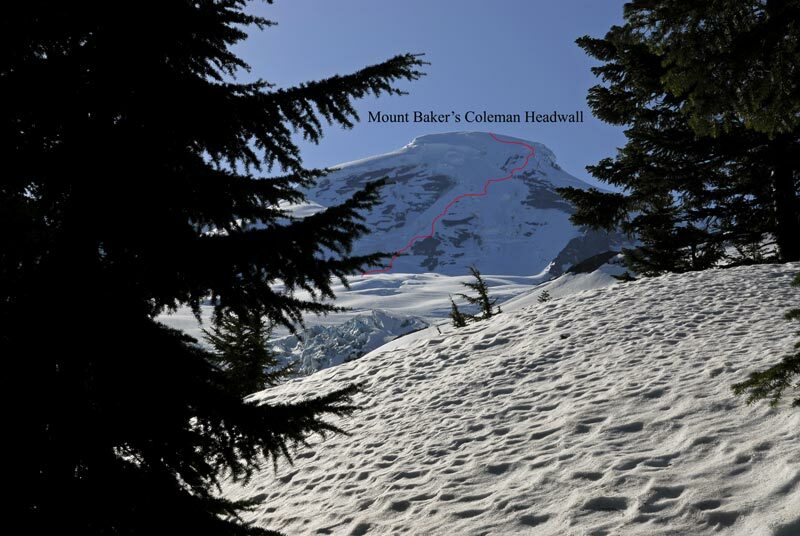 So how did we find ourselves on Mount Baker with plans to ski Coleman Headwall? I have only the weather to blame and I'm glad that our complaints didn't compromise a fantastic weekend! 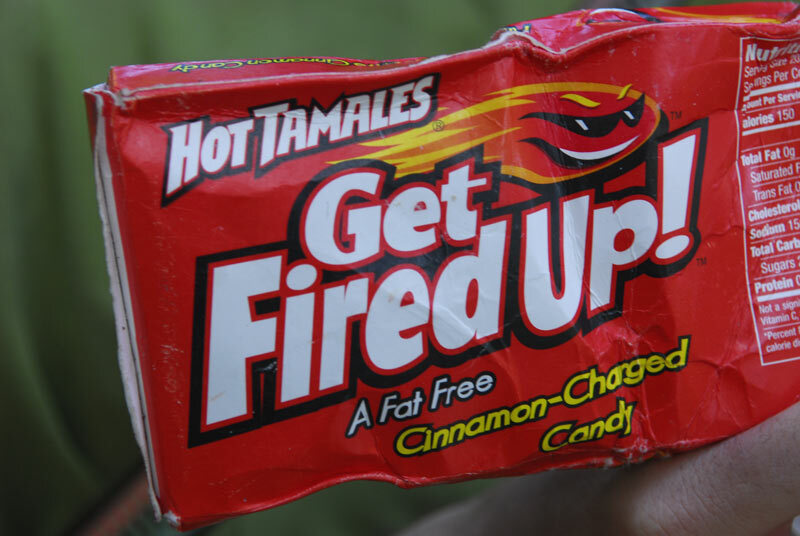 We were about to GET FIRED UP. Today's adventure The Coleman Headwall was a project that had snuffed me three times before and I knew that finally this would be the day. There'd be no excuses, she was gonna be mine or I'd be hers. People were everywhere and there were already skiers flying down the mountain. 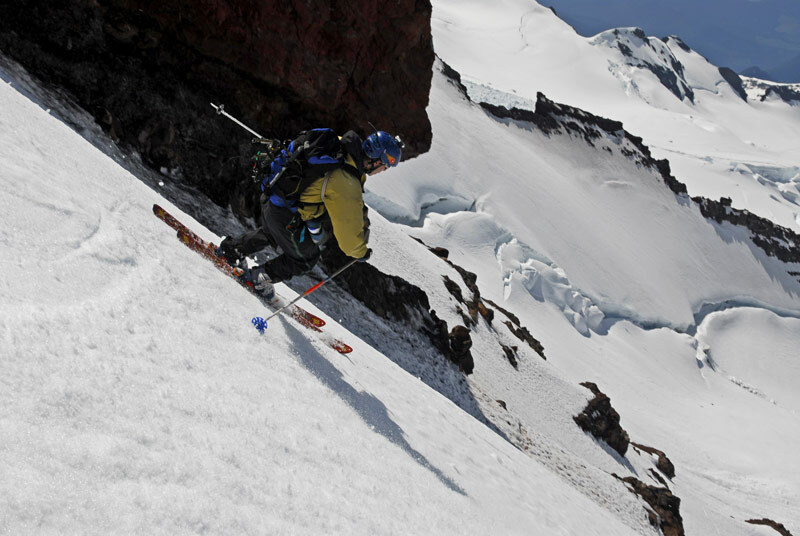 Not many years past you'd never see more skiers than climbers. 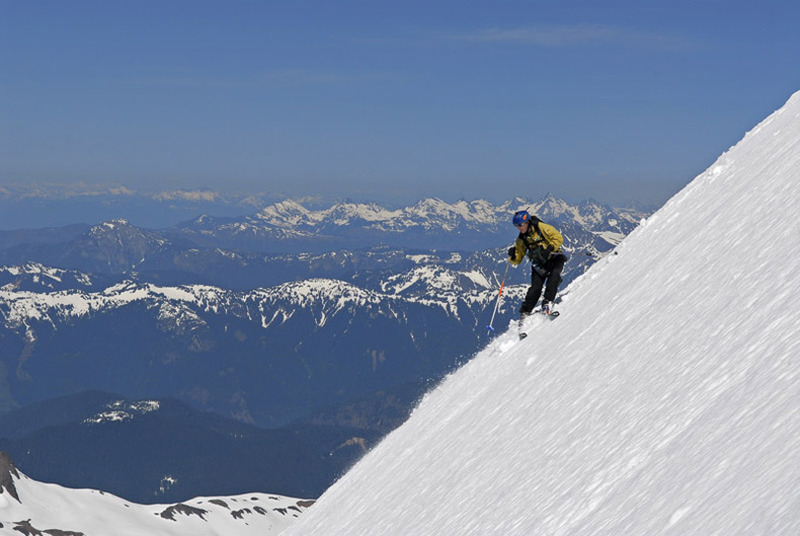 Maybe now, people are learning that 'Skiing can be fun.' 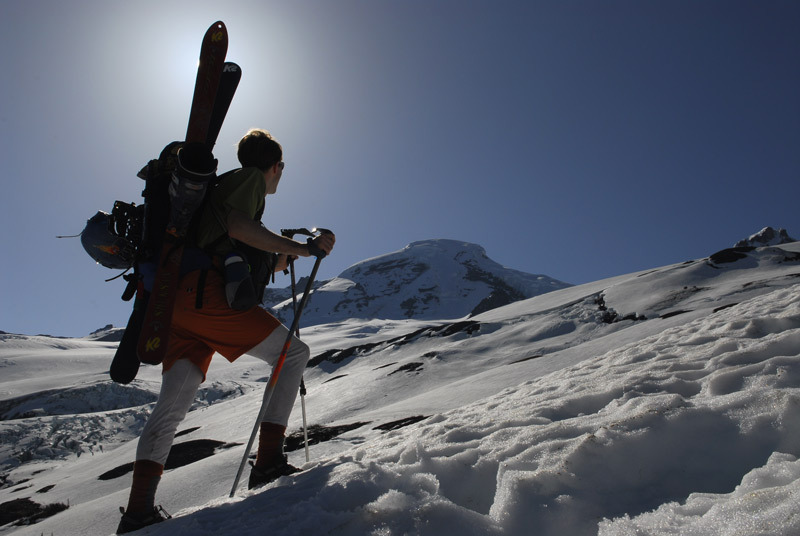 Watching a group of climbers slog down, clothed in every scrap of clothing imaginable and packs loaded for expedition: Everest, I suddenly felt guilty about my shorts on and skis comfortably and quickly whisking me by. One last look shows the heroic leader post-holing to his knees and in the back another climber falls on his face. "What an awful experience," and I wonder if any would ever climb again? In hindsight, I know they would. For many this had been the time of their lives! Phil and I took it easy, meeting a polish skier from Abbotsford, Canada and another party of two skiers. Like I am apt to do, I stuck up conversations with both, which made the long haul to the Col easier. I probably talked too much, but that's nothing new. 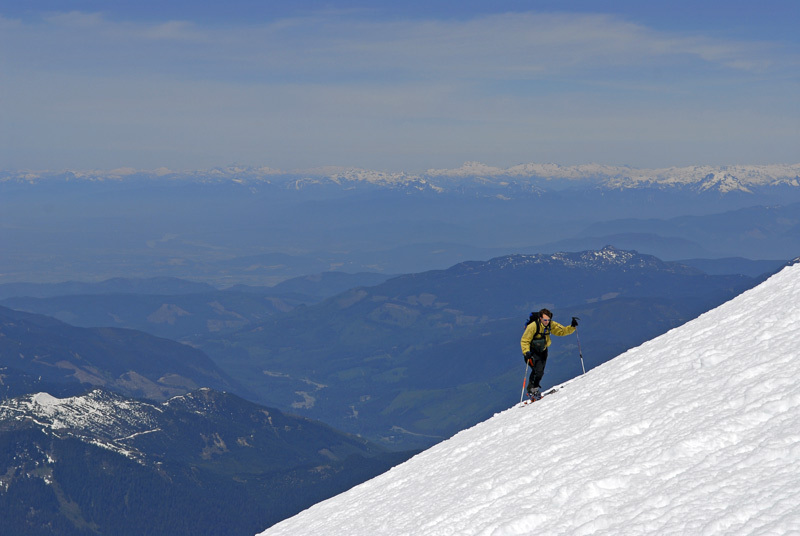 Reaching the summit cap, I veered left away from the crowd on or about the topmost point. 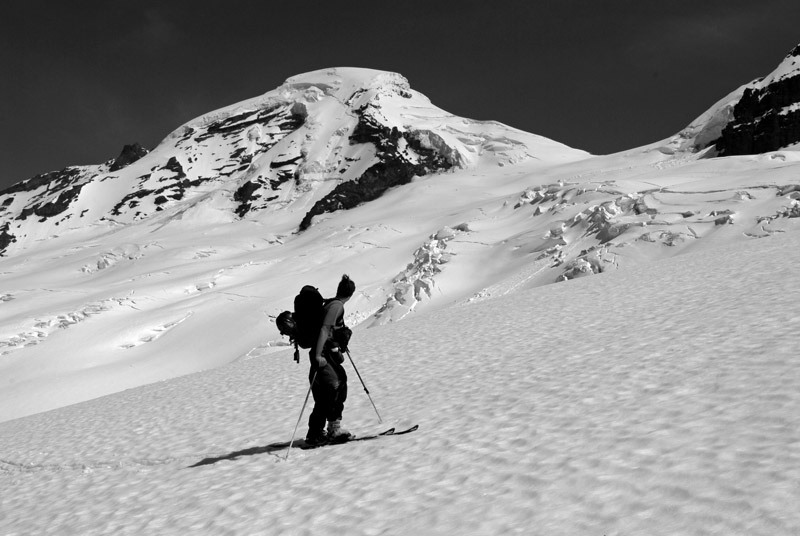 The snow was as soft as I'd seen it on the summit, but I was still afraid of what I'd find on the face. 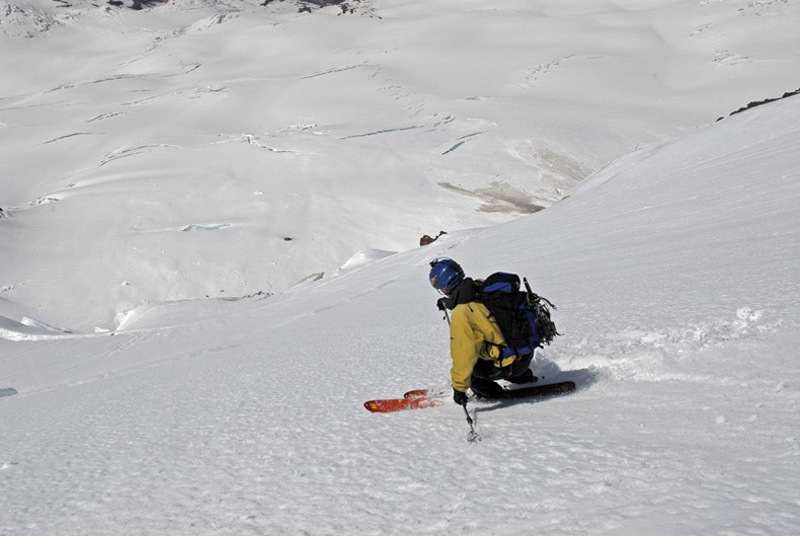 Dropping in blind is a demoralizing experience and one that I don't take lightly! 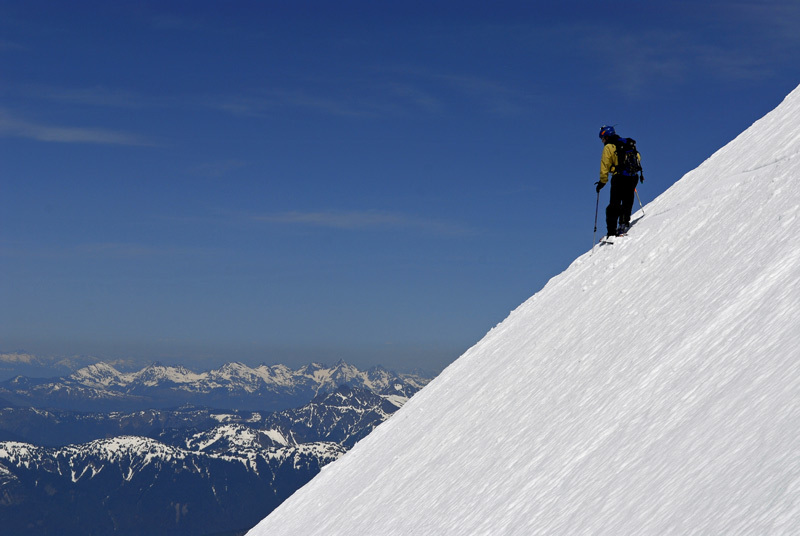 Conservative, conservative, conservative is the ring-tone of any ski-mountaineer who plans on being around long. Phil wanted to take a break and I waited for as long as I could. Scouting down the mountain turn by turn, further and further down the ever-steeper roll, I came to a place that hung above the top most ice-cliffs. Turning around took effort and I finally ended up swallowing my pride and not turning here; it was mind-numbing to look down, but it looked better to the left. I made a switch turn, which probably wasn't any safer than turning would be. Further to the left, I sighted Phil where I had sent him. He was right on course. I played scout again and spotted black ice patches. 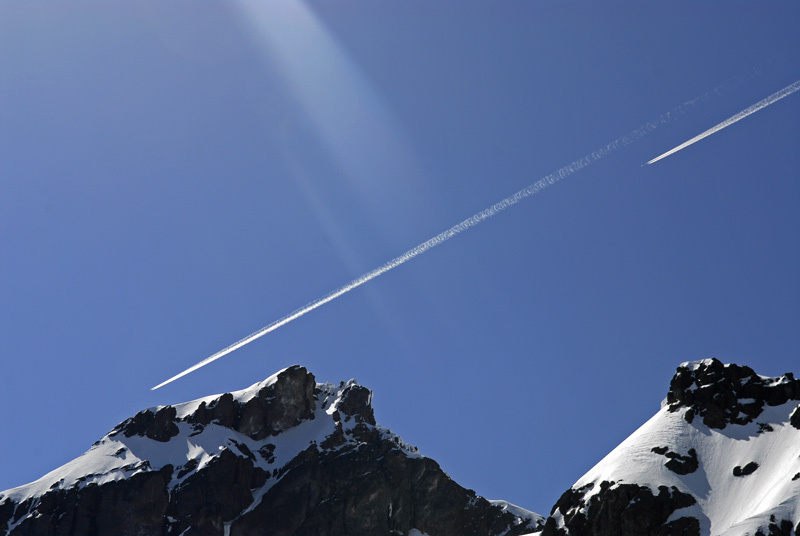 I didn't want to get anywhere near those and so decided not to ski the central headwall. Plus, the bergschrund was an unknown factor and I couldn't say for sure if it was even there. What if I was wrong? Again I chose to be conservative. Further down I was able to traverse and what an experience that was for me. 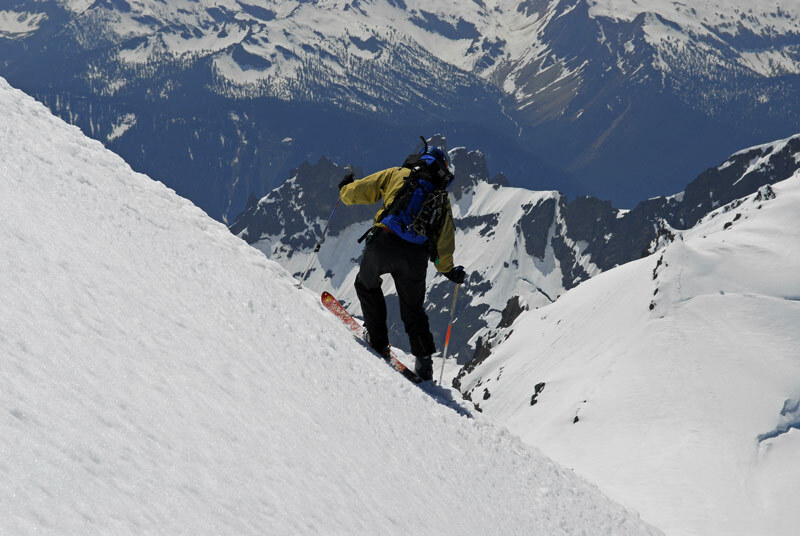 Here I was, on the face I had dreamed of skiing and the turns were spectacular! This was where we found the best snow and thus my confidence which was beginning to eke its way back into my legs until, "Whoa, ICE," hollered Phil. It wasn't really icy, but there was a layer of corn snow on top of a hard layer. 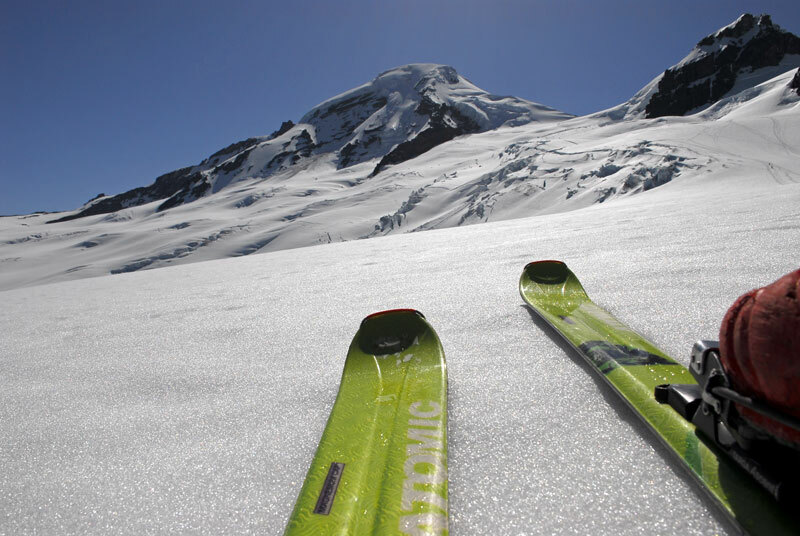 I've skied this kind of snow before and it's not good when it melts, since it tends to break away and leave you with nothing good to ski down on. In a few places that layer would poke its nose out. 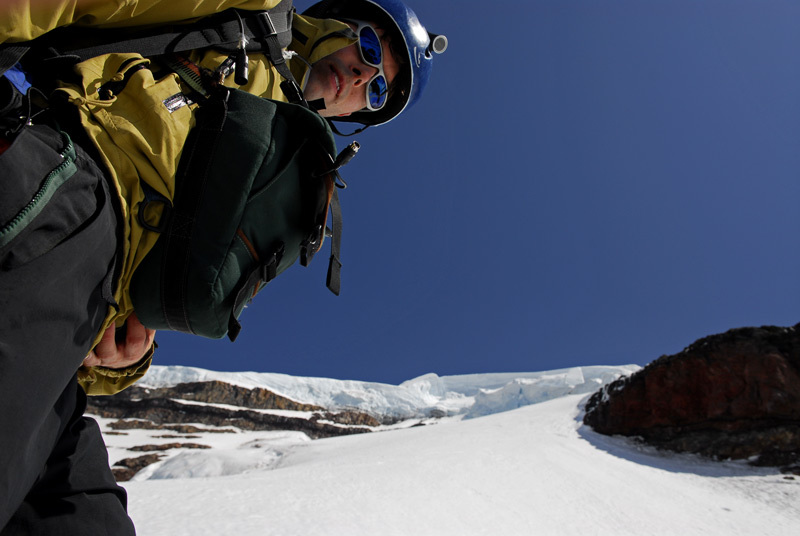 We decided to rest on a safe shoulder of rock, but ice-cliffs appeared too formidable to temp. They could wipe us off like vermin in a second. Below us there was one final schrund to get around. To the far right there was a nice snow-bridge and right below us I thought I could see another way, but before I could go down and check it out, Phil took the lead. The next thing I noticed was him falling and a holler. Even at the very bottom of the route, it wasn't a good place to fall. Right below him, just feet away were hungry crevasses. 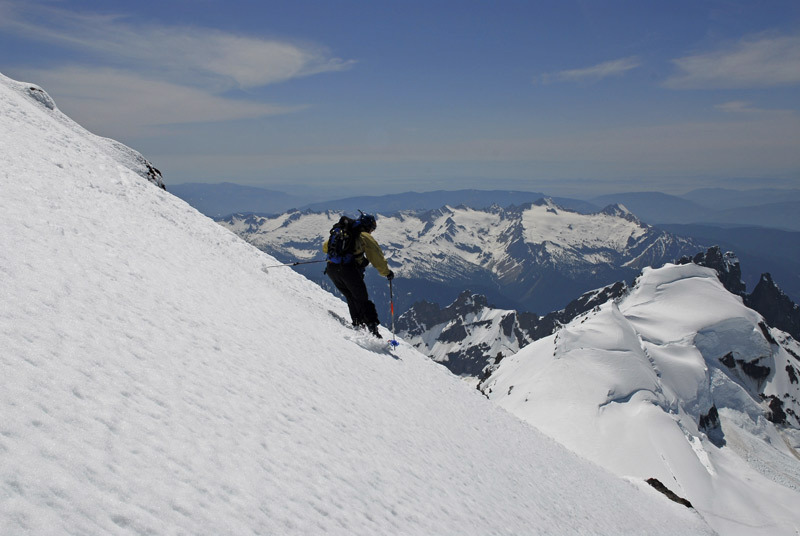 "Watch the drop, the snow is soft," is all Phil shouted to me as he skied away. It's best not to dally and think about it. I looked into the hole he nearly fell into and thought about how much that would'a sucked. No matter how much you think about it, you can never qualify how close it really was. 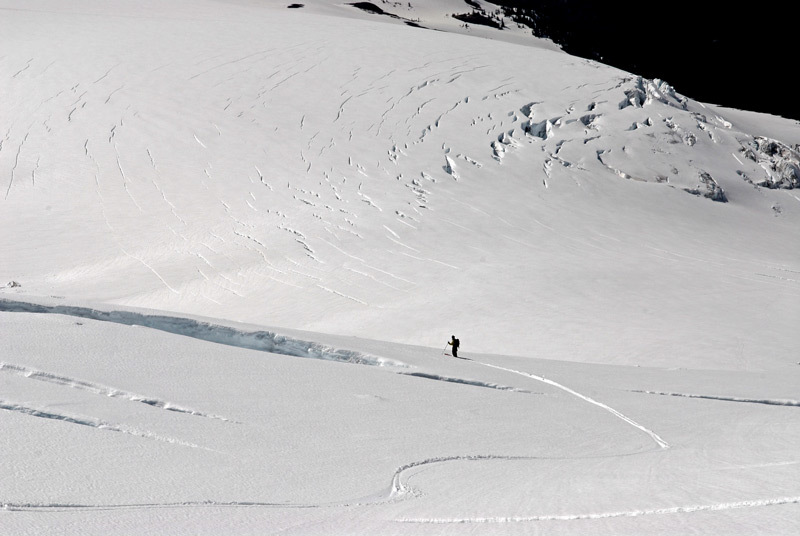 "I didn't even look in the crevasse," Phil told me on the glacier. "I don't know how deep it was?" I didn't have to tell him, he knew I was lying when I said it wasn't that bad. 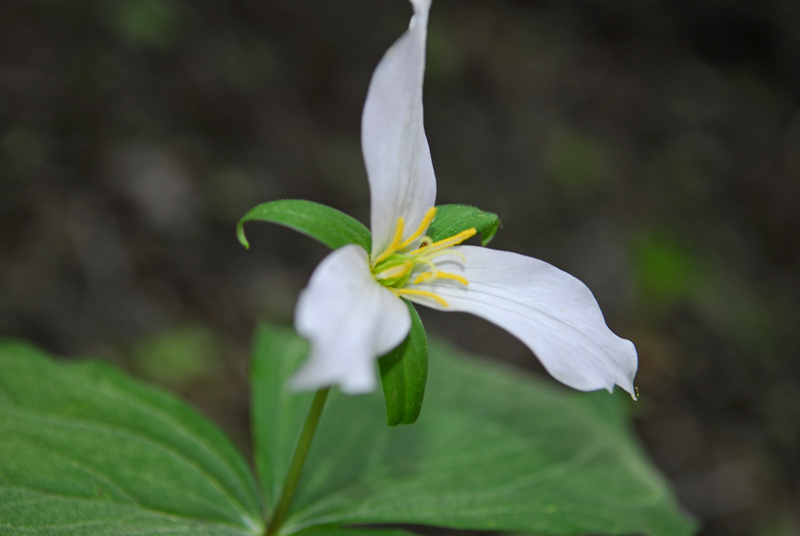 If you like flowers...check out my plants and animals section. 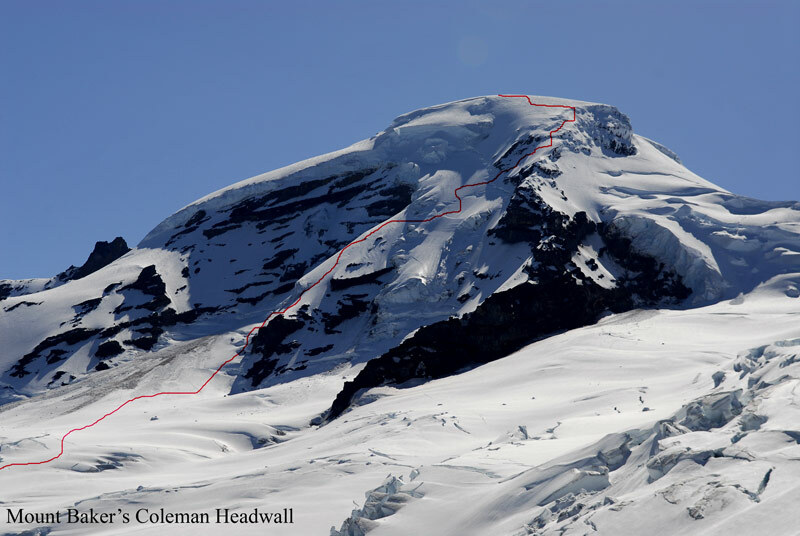 After winding our way up and down, over and around and all over the Coleman Glacier, we came to the boot-pack on the standard route. Here I took a moment to look back and appreciate. Right then, the risk and price of such an adventure didn't bother me and maybe it should have. In the youth of your life, most of us take risk. For me it's better than smoking and drinking or wasting my life in front of video games and TV. In a sense, sitting there and looking back, the reward was fear-reversing/relief-enhancing and that was quite a feeling. You could say, satisfaction was in blossom and today I had won out. In the beginning of this trip I had said, "She was gonna be mine" or "I'd be hers." Given today's events, she was mine, but don't forget this, someday I'll be back in her arms. Maybe in this way I'll always be hers. Phil and I enjoyed this route so much. I believe I'd do it again! If you want to read about it instead, check out cascadeclassics.org and search out Ben Manfredi's stories of the route. >>>>back to Chronological.